‘Enchanted Town’ is a brand new creative concept uniting ideas, local culture and history, music, street theatre, live performance, digital arts and cutting edge technology in a fun, open and accessible presentation … aimed at engaging all levels of public in a vibrant and fun environment. 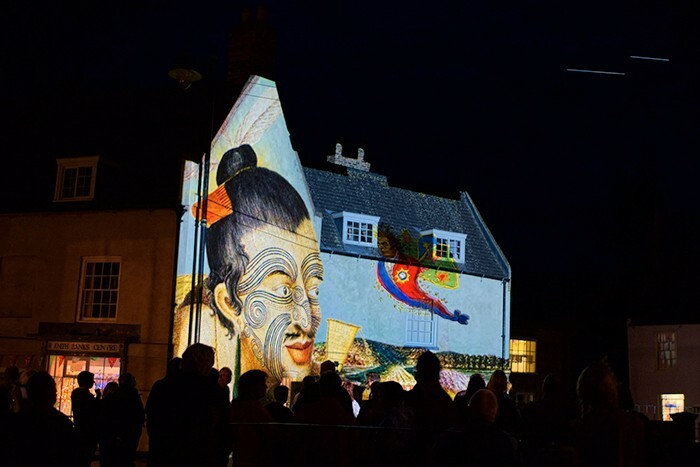 The first pilot event was staged last weekend at Horncastle, Lincolnshire, proving a massive success and pulling 4,000 visitors into the town centre for the evening, boosting local businesses and creating a brilliant vibe. Even the weather got into the mood! 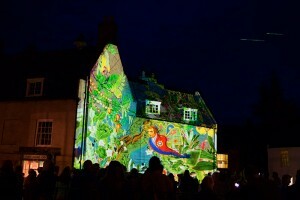 Enchanted Town is the brainchild of an innovative collaboration between leading outdoor arts producer and festival director Robin Morley from Magnetic Events, internationally renowned large format projection and digital artist Ross Ashton and ground-breaking sound artist and audio designer Karen Monid. The event was presented by East Lindsey District Council working with the Horncastle Festivals Committee. 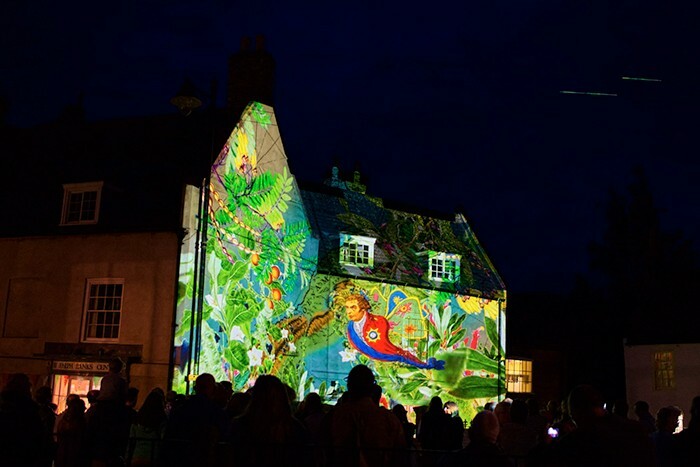 It was also the opening event of the SO Festival, 10 days of shows, events and culture taking place across East Lindsey, funded by East Lindsey District Council, Arts Council England and Centrica Energy. Morley, Ashton and Monid have previously worked together on a number of projects, including the very popular ‘Enchanted Parks’, an annual public art event taking place in Saltwell Park in Gateshead since 2007, produced by Morley and presented by Newcastle Gateshead Initiative and Gateshead Council. This comprises a number of commissioned temporary public art works – for which Ashton and Monid have produced signature pieces - involving unique projections and immersive soundscapes encompassing local elements and themes. It attracted up to 35,000 people over five days in December 2012. The idea behind ‘Enchanted Town’ or Enchanted City’ is that it can be transposed to any location. With the aid of visual magic, interactive street theatre and any number of other activities – including contributions from local artists including a video film group - it will pull both visitors and business into an urban setting, enriching the location by allowing all to enjoy the surroundings and be entertained in imaginative, new and different ways. 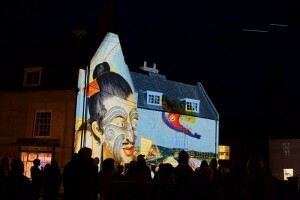 The centrepiece of the Horncastle Enchanted Town event was two large format video projections works created specially by Ashton, complete with bespoke soundtracks from Monid, which took their starting points from some well-known local personalities – primarily the poet Alfred Lord Tennyson and botanist Sir Joseph Banks. The first, ‘Spiritus – Ring Out Wild Bells’ was projected onto the bell tower of St Mary’s Church. The stunning 14 metres high by 8 metres wide images were beamed from a doubled up pair of Barco CLM HD8 projectors rigged in portrait format and installed in a specially constructed tower. When creating the images, Ashton took the splendid wooden angels holding up the church roof as his visual starting point, and created an animated story around them, which played out on an 8 minute loop. Tennyson’s ‘The Wild Bells’ was first published in 1850, the year he was appointed Poet Laureate. Monid’s compelling and beautiful soundtrack used quotations and passages from the poem together with other elements. The second projected work "The Magical Spying Glass" utilised the Banks Building as its canvass. The building is named after naturalist and botanist Sir Joseph Banks, born in Lincolnshire, who accompanied Captain James Cook’s first great voyage to the Southern Seas (1768-1771). Ashton’s eye-catching content unfolded a fantasy tale inspired by that voyage, with Banks starting off as the Great South Sea Caterpillar. It also incorporated legendary sea monster, the Kraken (the subject of an irregular sonnet by Tennyson). Artwork was based on some of Banks’ botanical drawings taken from the Cook voyage together with various cartoons and caricatures of Banks by 18th century satirist, James Gillray – among other materials. In the 3.5 minute projected movie, Banks was transformed from the caterpillar into a South Sea butterfly and flitted around a garden composed from his own drawings, ending up in New Zealand, where he went underwater and came face-to-face with the Kraken! This gave Ashton plenty of leeway to create a colourful and amusing allegory. The single Panasonic EX12 projector was located in the Travis Perkins showroom about 25 metres way, which was the optimum position to make up the 13 metre wide image. Monid again composed an intricate and fun soundtrack which added to the drama and sense of spectacle, enthralling onlookers. The projection and sound equipment for both installations was supplied by locally based Enigma Effects. Portfolio Holder for Culture, Leisure and Tourism at East Lindsey District Council, Councillor Adam Grist, commented that they were "absolutely delighted" with the response. "To see so many people in the town centre enjoying the acts and illuminations and supporting local businesses was wonderful." Robin Morley said: "The response exceeded our expectations in terms of visitor numbers for the first Enchanted Town event. It was a real pleasure to work with Ross and Karen again who are absolutely at the top of their game, and having international artists of their calibre involved certainly boosted the success of the whole project and in creating a truly magical event." Ross Ashton stated: "We really enjoyed working in Horncastle – the setting is fabulous and it proves that you can hold events like this in the UK - at any time of the year - and people will come out and enjoy." Robin Morley concludes that they are already being asked to consider ideas for next year’s Horncastle Enchanted Town.